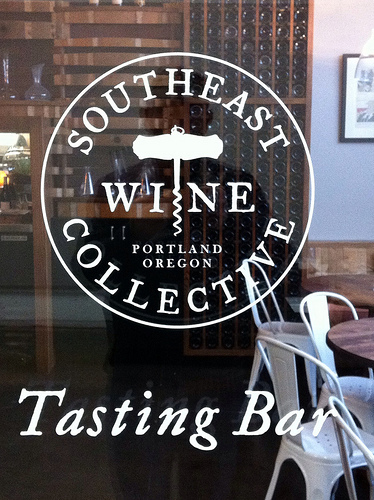 The South East Wine Collective is a new venture that opened this fall in South East Portland. The project is the brainchild of Kate and Thomas Monroe and came to life as they were scouting their neighborhood for a new production facility to host their own winery - the Division Wine Making Company. The “best space” turned out to be larger than necessary for a single winery, so the idea for the SE Wine Collective was born. They invited three other urban Portland winemakers to join in the venture. The space plays host to Helioterra, Vincent Wine Company, Bow & Arrow and of course the Monroe's Division Wine Making Company. Putting together the group of wineries was pretty easy. 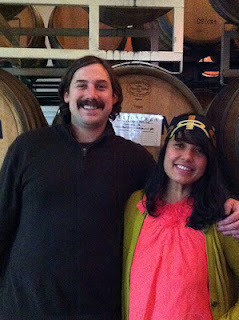 All the winemakers already knew one another as members of the close knit urban wineries in the Portland area. They are all at a similar point in developing their businesses; building a brand and reputations and many still hold a second “day job” while running their wine making ventures. The excitement is palpable at the SE Wine Collective. Everybody is really stoked about having their production facility and tasting room right in their own community. Anne as well as Kate and Tom live right in the SE neighborhood. They are building connections with their neighbors and you can feel the energy it is generating for the winemakers and for visitors. The tasting room has a hip urban feel to it. The ceilings are double height and the interior is a mix of warm woods and urban concrete. There is a private dining room and barrel room right next to the wine bar. The space is cozy and is already being put to good use. Anne hosted a private dinner for 20 Helioterra Wine Club members as a harvest celebration. A gourmet food truck brought the feast to the revelers, parking at the facility and preparing fresh pasta dishes for the event. Anne explained how cool it is to be working in the production facility and see somebody enjoying your wine in the tasting room. She has taken the opportunity to introduce herself and share some of her story with the people enjoying her wine. If you are lucky, you might even get to lend a hand with a punch down or some other aspect of the wine-making process. An advantage of sharing the production space is the ability to share ideas and equipment with one another. Tom and Kate had most of the production equipment and the other winemakers have contributed some of their own equipment as well. There has always been an ethic of sharing withing the urban Portland wine scene. Now, with four winemakers in one place, the cooperation come even more naturally. That ease and access to more equipment turned out to be a major coup with the 2012 vintage. 2012 turned out to be one of the driest seasons in Oregon in the last 30 years. The fruit was beautiful with the Pinot Noir being a bit riper than usual. The quality of grapes this year lead to higher production yields per ton than previous vintages. There was very little waste and mold was not an issue in 2012 like it has been in so many other vintages due to the moister weather that Oregon typically experiences in comparison to Washington. Each of the winemakers has a slightly different style. Anne makes Pinot from the Willamette Valley and some single varietals from Washington grapes. She focuses on letting the fruit express itself and often asks for her Washington fruit to be harvested early to maintain some of the subtle character of the grapes. Helioterra 2010 Columbia Valley Syrah Sourced from the Coyote Canyon vineyard in the Horse Heaven Hills AVA. The Syrah is co-fermented with Viognier. Thirty percent of the Syrah is fermented as whole clusters. The result is a really nice Syrah that shows off notes of dark fruit, all-spice and cracked pepper along with elegant floral overtones. Vincent 2011 Zenith Pinot Noir – Vincent let the grapes ferment for several days before any punch downs and then only did a single daily punch down until pressing off the juice to produce a Pinot Noir that is spicy and medium to full bodied with ripe strawberries, all spice and hints of white pepper. Vincent says the grapes from Zenith are a bit more robust and are able to stand up to more time in the barrel which leads to the additional spice character in this wine. Tom and Kate are heavily influenced by the time they spent learning the wine-making process in France. In fact, they began their careers by travelling back and forth between the States and France to take part in three vintages. Each time they worked in a different region of France. The time they spent in Beaujolais inspired them to make a wild, young and racy Beaujolais Nouveau that was being released at their Pre-Thanksgiving Party. Division 2011 Chardonnay is made from Chardonnay vines that were planted in the mid-70s. These are some of the few remaining original Chardonnay vines planted in Oregon. The grapes come from the Eola springs area west of Salem. 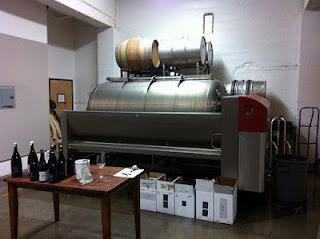 Tom uses one stainless steel tank, one neutral barrel and one new barrel when making this Chardonnay. The barrels are made for white Burgundy wines which allows for some nice subtle barrel notes to come out in this gorgeous example of Chardonnay. Bow and Arrow focuses on making wine in the style of the Cheverny region of France located in the Loire Valley. The red wines from this region are all blends of Pinot Noir and Gamay. Scott chose this style to provide “something different” while still using the Pinot Noir grape that is so prevalent in Oregon. Bow and Arrow 2011 Rhinestones because France makes the Diamonds, anyplace else is just making imitations… A blend of Pinot Noir and Gamay this is a medium bodied red wine with enough acidity to make it a refreshing complement to a variety of dinner dishes. The urban wine scene in Portland is kicking out the jams! If you live in the area, or are just passing through, you need to make time to stop in at SE Wine Collective and see exactly what all the excitement is about. This place is brilliant! 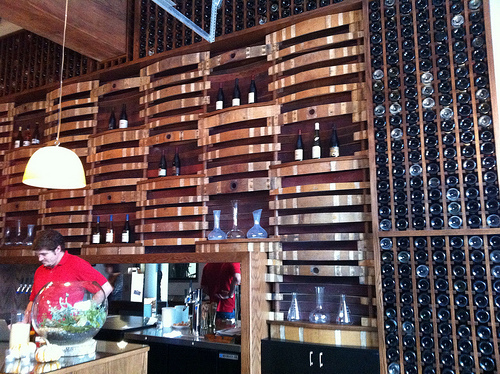 The building is beautiful, the people are great, and there is a nice variety of wines available. I was really looking forward to the opening after talking with Thomas during the urban passport event; his enthusiasm for the project was quite infectious. It is nice to see such a collaborative effort, it can only be good for the area and for us wine lovers. Sounds like you guys have a good thing going in the neighborhood there, wish we had something along these lines in Seattle.